Sumérjase en la antigua majestuosidad de los monumentos de El Cairo en una visita privada de todo el día al Templo del Valle, Sakkara y Dashhur desde El Cairo. Junto a un experto guía privado, visite la magnífica Gran Pirámide del Rey Keops y explore las misteriosas tumbas del Templo del Valle. Maravíllate con la enigmática Esfinge; contemplar el complejo del rey Zoser en Sakkara; y profundizar en la historia antigua de Memphis durante una visita guiada. Reciba atención personalizada de su guía privado en esta gira enriquecedora. Recibe toda la atención de tu guía profesional. Disfrute de la comodidad del transporte de ida y vuelta en un vehículo de lujo. Sam was an exceptional tour guide, easily the best Egyptian guide I've had. His deep knowledge of Egyptian history was phenomenal. 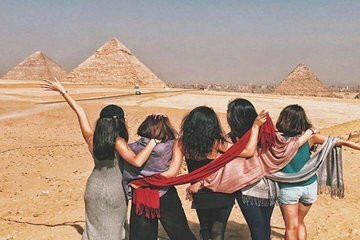 This particular tour highlights both the touristy and not as frequented areas of Cairo and nearby destinations, truly a great balance especially to see if you're on a quick trip to the area. There were not many tourists in the areas of Sakkara and Dahshur which was a nice break from the common crowds. In Dahshur, I had the option of venturing down into the Red Pyramid at no cost..I was just one of three people there! Highly recommended! I looked through hundreds of tours on Viator and this one was one of the few I could find that had everything we wanted to do- Giza/Sphinx, Sakkara, Dashur and Memphis at a great price. The guide Mohamad was very professional and very presentable. He had good connections with all the security/ticket takers at all the sites. During the rides between sites he was always available to give us details of culture and answer our many questions. He was full of information but did not overwhelm us. He did not give us any sales pitches on shops and kept the sales people/camel people away from us. We went on a number of tours and had a number of different guides throughout the week. Mohamad was our favorite. I highly recommend this tour! Hope you get Mohamad! And the driver also named Mohamad was very professional - always jumping out of the car to open our doors etc, safe driver. This trip was absolutely incredible. It is an absolute must. Mohamed and the driver were so kind to us, and took care of us throughout the entire trip. He adapted the tour to fit our needs and requests, and was very gracious in taking numerous photos of us in front of such incredible sites. He answered all of our questions, and helped negotiate many of our purchases on our behalf, including getting on a camel for a photo. I can't possibly over-rate this trip, by far one of the best travel experiences I have ever had! Thank you again, Mohamed!